What a scoundrel wants, a scoundrel gets . . . A decade ago, the Marquess of Bourne was cast from society with nothing but his title. Now a partner in London’s most exclusive gaming hell, the cold, ruthless Bourne will do whatever it takes to regain his inheritance—including marrying perfect, proper Lady Penelope Marbury. A broken engagement and years of disappointing courtships have left Penelope with little interest in a quiet, comfortable marriage, and a longing for something more. How lucky that her new husband has access to such unexplored pleasures. 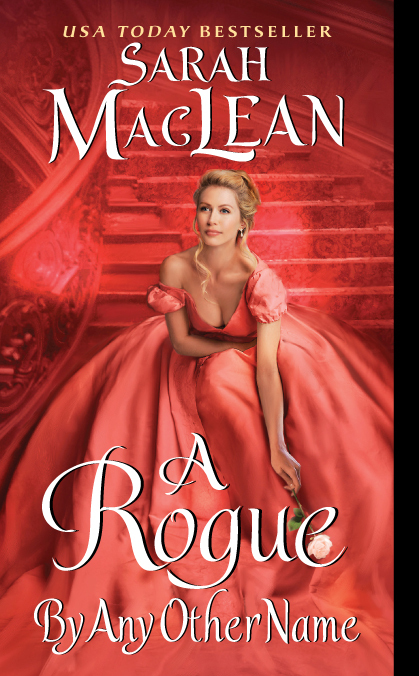 Bourne may be a prince of London’s underworld, but he vows to keep Penelope untouched by its wickedness—a challenge indeed as the lady discovers her own desires, and her willingness to wager anything for them . . . even her heart. I was having mixed feeling about reading this book, or rather buying it, to be perfectly honest. Anyway, I broke down and bought the book in ebook format for my Kindle. You see, I absolutely adored the Sarah MacLean's first two books of her Love By Numbers series, but unfortunately the third and final one was a disappointment in my opinion it lacked everything that the previous had. You can find my thoughts Nine Rules to Break When Romancing a Rake here. My thoughts on Ten Ways to Be Adored When Landing a Lord are here. My thoughts on Eleven Scandals to Start to Win a Duke's Heart are here. A Rogue By Any Other Name is the first book of a quartet series, called The Rules of Scoundrels. It's Bourne and Penelope's story. They were child friends and neighbors. Penelope had always a soft spot for Bourne, and she admired and cared for him deeply, but throughout the years it became more one-sided in Penelope's mind. She missed her friend and childhood companion. Bourne had a hard time after his parents death, he lost all his money and property to someone he thought of as a friend in a game of cards. Since then he vowed revenge, and he now he comes back to retrieve what was once his and he has no problems using Penelope is his plan. Both Penelope and Bourne have their demons. Bourne's need to retrieve his inheritance and need for revenge consumes him, he cannot forgive the friends he blames nor can he forgive himself. Penelope lives with the shame of being set aside by a her intended, the snob of book 3 of Love By Numbers. She's perfectly content on living her life as a spinster, but she feels like she owes her parents and sisters more than that. When Bourne insists on getting married, she is hesitant but hopeful that the boy she once knew is still in the bitter man. I didn't want to like Bourne right away, but there's was something about him that made me do so. He was so angry and disappointed in himself that he wanted to hurt those he felt responsible for his mistake. And he was willing to hurt and use someone that he once cared for, but soon you saw that his exterior was cracking with Penelope's help. Their relationship didn't start right but it slowly came to be a wonderful love story. I'm hoping that the next book will be as good as this one.